We take a lot of pride in eating well here. 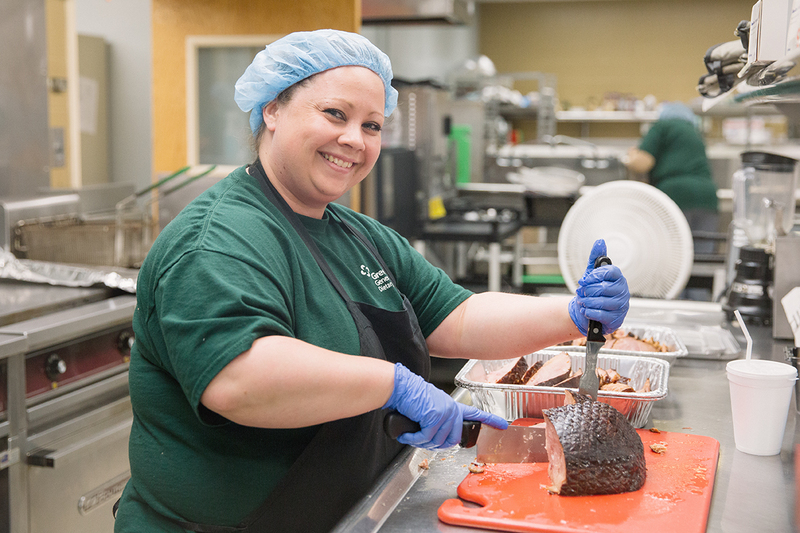 If you have ever visited our cafeteria, aka “The Lone Tree Cafe,” you know exactly what that means. Good food is an important part of our health, and we know that this time of year it can be especially challenging to eat right. That’s why we are once again offering our Happy, Healthy Holiday eCookbook for free download. You can also find it on our Nutrition Services page, and under Fitness & Wellness. These recipes have been reviewed by our Registered Dietitian, Lisa Berns, and include easy to read ingredient lists, directions, and nutritional content. There has never been an easier way to get clinically approved holiday fare ready for you and your loved ones. Download your free copy today, and if you enjoy the recipes let us know! We’d love to see pictures of your healthy holiday fare on Facebook and Twitter. so we can find your culinary creations! 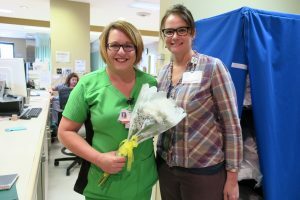 Nurses at Greene County General Hospital are being honored with The DAISY Award for Extraordinary Nurses. The award is part of the DAISY Foundation’s program to recognize the super-human efforts nurses perform every day. Kensey Goad, RN, who works in the hospital’s Intensive Care Unit was the DAISY Award Winner. 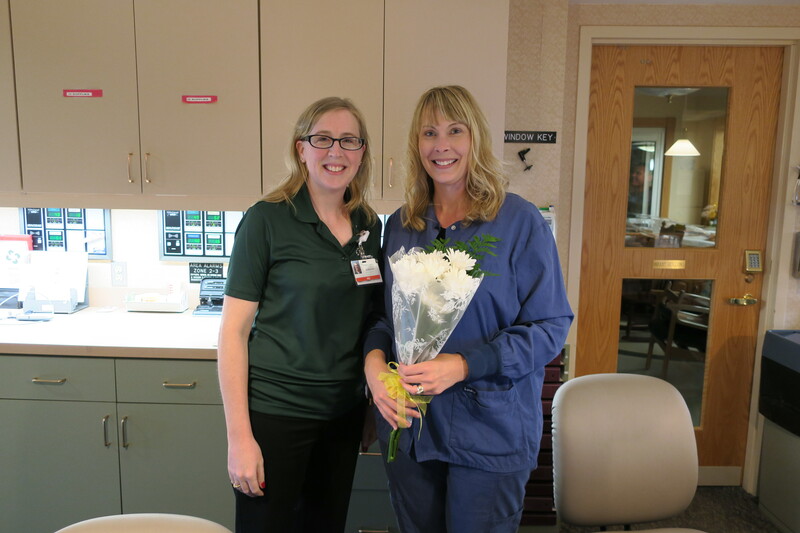 Kensey was nominated by a patient who deeply appreciated her compassion and excellent care. 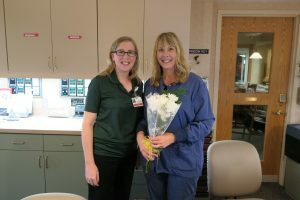 Two nurses were recognized as DAISY Runners-Up: Susan O’Neall and Brooke Driscol; and nurses recognized as DAISY nominees included Jackie Goodwin, June Herndon, Sarah Hodson, Brandee McKee, Chris Moore, Adam Morrill, and Patrick Sparks. The not-for-profit DAISY Foundation is based in Glen Ellen, CA, and was established by family members in memory of J. Patrick Barnes. Patrick died at the age of 33 in late 1999 from complications of Idiopathic Thrombocytopenic Purpura (ITP), a little known but not uncommon auto-immune disease. The care Patrick and his family received from nurses while he was ill inspired this unique means of thanking nurses for making a profound difference in the lives of their patients and patient families. 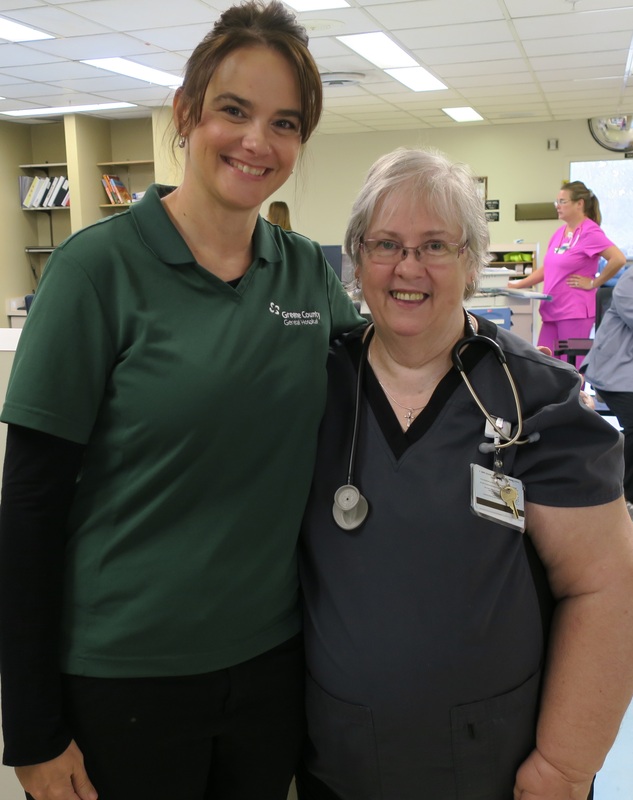 Three times each year, a nurse is selected by Greene County General Hospital’s nursing administration to receive The DAISY Award. At a presentation given in front of the nurse’s colleagues, physicians, patients, and visitors, the honoree will receive a certificate commending her or him for being an “Extraordinary Nurse.” The certificate reads: “In deep appreciation of all you do, who you are, and the incredibly meaningful difference you make in the lives of so many people.” The honoree will also be given a beautiful and meaningful sculpture called A Healer’s Touch, hand-carved by artists of the Shona Tribe in Africa. May 9, 2017 – Linton, IN – Greene County General Hospital welcomed Bonnie and Mark Barnes, Co-Founders of the DAISY Foundation for a unique award presentation today. The DAISY Foundation is a national award program that recognizes nurses for outstanding patient care. The Barnes started the Foundation when their son, Patrick, passed away after weeks in a hospital in the early 1990’s. “The only positive thing that came of Patrick’s ordeal was his nurses,” said Bonnie Barnes, who went on to say that they chose to focus on the wonderful care and compassion they experienced. Their desire to honor the nurses who cared for Patrick and the entire nursing community became the DAISY Award for Extraordinary Nurses. 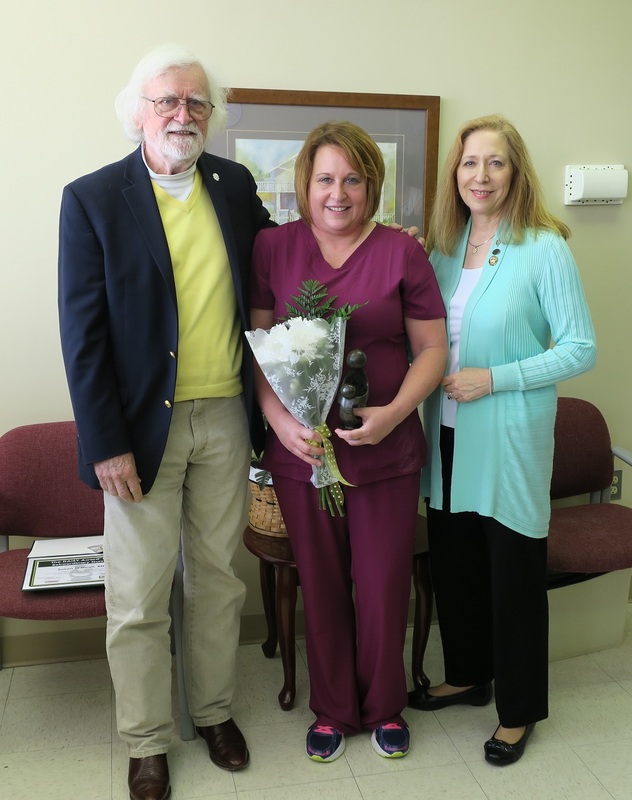 Greene County General Hospital has been a participating member of the DAISY Award since 2015, and presented its fourth award during the Barnes’ visit to ICU Nurse, Susan O’Neall. Flanked by previous honorees, Eric Corbin (ER) and Brooke Driscoll (OB), O’Neall received her award in a room filled with colleagues and family while the Barnes family told their story and thanked her for her service. DAISY Award coordinator and Quality Assurance Director Jill Raines read O’Neall’s nomination to the group, an emotional story about a mother and her son. The patient had been hospitalized on her son’s wedding day and would miss the ceremony due to a serious illness that would take her life the very next day. O’Neall served as her nurse in the Intensive Care Unit, and knew how important it was to her patient to see the ceremony. O’Neall quickly secured a tablet for her patient and was able to connect her to the ceremony via Skype. They watched the entire ceremony, even the kiss, from the patient’s hospital bed. The Barnes family was deeply touched by this story of compassion and excellence in nursing, remarking that the story was a perfect example of the kind of care they experienced first-hand and know to be common among nurses who rarely see their service as extraordinary. The celebration included special refreshments unique to the DAISY Award. The hospital’s cafeteria provided homemade cinnamon rolls, the only food Patrick Barnes was able to eat during his hospitalization. A connoisseur of the treats, Mark Barnes remarked that they were the best he had ever had. Greene County General Hospital accepts nominations for the DAISY Award year round. Forms are available on the website at GreeneCountyHospital.com, or at the DAISY Award stations placed throughout the hospital. Dr. Fred Ridge Joins Greene County Health, Inc.
Dr. Fred Ridge has announced the merging of his practice with Greene County Health, Inc. Ridge has long been affiliated with Premier Healthcare, a Bloomington-based physician group that has recently joined IU Health, Southern Indiana Physicians, Bloomington. Dr. Ridge and his team will continue seeing patients in his current office. Dr. Fred Ridge is board certified in Family Medicine. Board Certified Family Physicians are medical specialists who provide continuing and comprehensive medical care, health maintenance, and preventive services to patients of all ages and conditions. 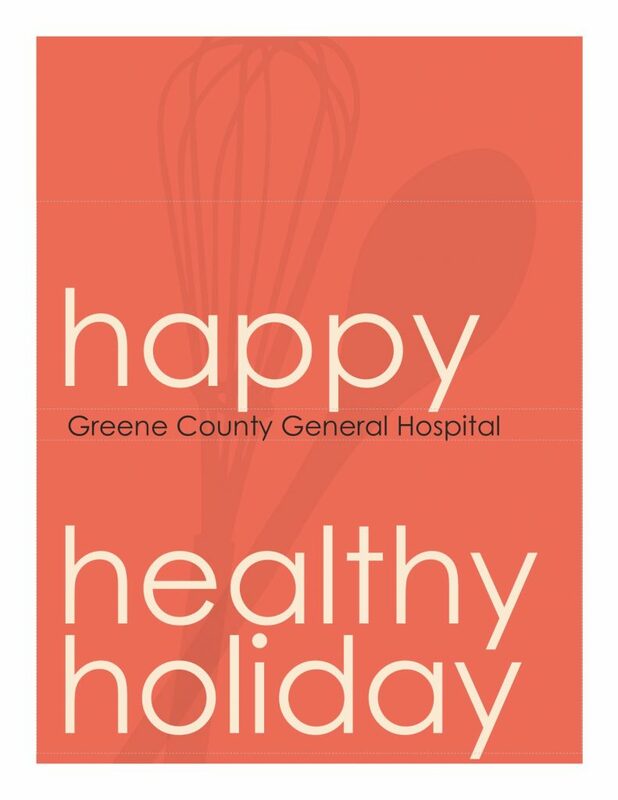 Greene County General Hospital and Greene County Health, Inc. are separately operated, but work together closely to provide optimal patient care to Greene County residents and the surrounding area. Greene County Health, Inc. is a family practice physician group offering same day appointments and weekend hours at six locations throughout Greene County. They offer full spectrum family medicine, including OB-GYN, pediatrics, minor surgery, and much more, at their locations in Bloomfield, Jasonville, Linton (2), WestGate, and Worthington. Greene County Health, Inc. is currently pursuing Federally Qualified Health Center Lookalike status. Greene County General Hospital CEO, Brenda Reetz, had an opportunity to sit down with Rural Business HQ, an online magazine and podcast, to talk about the challenges in modern health care. Keeping the local hospital strong is a must for building a rural economy. Those receiving services at Greene County General Hospital will soon have a new way to access clinical summary information via a newly launched Patient Portal. In compliance with the federal government’s Meaningful Use Initiative, all hospitals will soon be required to provide patients (and/or a patient-authorized user) access to their patient record electronically. Patients – inpatient and outpatient – are now asked to provide the Registration Department with a secure email address. Chief Nursing Officer Lea Ann Camp said patients need to be confident in the security of the email address they provide. Work email addresses, Camp said, will not be accepted. Having this electronic access through your personal, secured email will allow you as the patient the ability to review your medical history during your stay here at our facility. This access provides you with information, including but not limited to, procedures completed, medical history, medications taken, allergies, existing or developing medical conditions, etc. You can also virtually download your confidential medical record to your own private computer for your records. Upon discharge from our facility, patients will receive an auto-generated email to the email account collected during registration inviting them to create a user account at www.mymedicalencounters.com. The email will be generated from donotreply@mygcgh.org with the subject of “GREENE COUNTY HOSPITAL – Patient Portal New User”. The email will direct patients to step-by-step instructions on how to access their personal medical record. Instructions and more information can be found on the hospital’s website, www.greenecountyhospital.com. For assistance, please contact the registration or medical records departments at 812-847-2281. Once your account has been activated, you can view it at any time by visiting www.greenecountyhospital.com or www.mymedicalencounters.com. Lyons – Just after 6:00 o’clock this morning, a crash occurred on State Road 67 near County Road 700 West. A 2005 Dodge van, was travelling southwest on State Road 67 approaching a 2001 Freightliner tractor trailer combination loaded with coal, travelling northeast. For reasons unknown, the Dodge van traveled left of center and sideswiped the semi tractor. After initial contact was made, the van continued striking the left tandem axles of the trailer. After the collision, the van spun partially off the highway before coming to final rest. The semi came to a stop with the trailer partially blocking the southbound lane of State Road 67. The Dodge van was driven by Dakota L. Burnette, 26, of Oolitic, who was pronounced dead at the scene. Burnette’s family has been notified. A passenger in his vehicle was taken via Greene County Ambulance to Greene County General Hospital to be treated for his injuries. The driver of the semi, Timothy D. Stines, 44 of Bedford was uninjured. Agencies assisting at the scene were the Greene County Sheriff’s Department, Lyons Town Marshal, Greene County Ambulance Service, Switz City Fire Territory, Lyons Fire Department and the Linton Fire Department. Local leaders and residents turned out to discuss the pros and cons of Greene County during a Community Health Needs Assessment meeting, which was held at the Greene County General Hospital on Tuesday. The purpose of the meeting was to gather information such as strengths and weaknesses of the county in order to create a survey that will be made available to the public at a later date, explained Ally Orwig, a representative of the Indiana Rural Health Association. “We invited leaders in the community, such as clergy, education leaders, and others. The point is to [pinpoint] matters that need addressed in the community,” she added. A report highlighting the outcome of the survey will then be created, and the Greene County General Hospital will have three years to work on any issues, Orwig said. “The whole process will then be started over every three years,” she added. Some of the pros of Greene County that were brought to the forefront included the following: Good people, rural environment, individualism, small population, small schools, outdoor recreation opportunities, NSWC Crane, WestGate, Goose Pond Fish and Wildlife Area, Greene County General Hospital, agriculture, and coal, among others. On the other hand, some of the cons that were highlighted included the following: Poverty, lack of public transportation, obesity, lack of post-secondary jobs, drug addiction, drop in school funding, drop in school enrollment numbers, lack of fitness facilities, and others. The Greene County General Hospital is the largest employer in the county with an annual payroll that exceeds $15 million. Greene County General Hospital is pleased to announce that outpatient speech therapy services are now being offered. 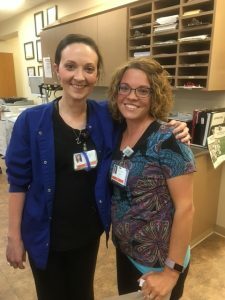 Kristen Witt, a 2003 graduate of Linton-Stockton High School, recently joined the hospital’s staff and began offering a variety of speech therapy services to all ages ranging from pediatrics to geriatrics. Witt holds a bachelor’s degree in Speech, Language, and Hearing Sciences from Purdue University and a master’s degree in Communication Disorders from Western Kentucky University. Articulation disorders: Problems making/saying sounds correctly. Sounds can be substituted, left off, added or changed. These errors may make it hard for people to understand you. Phonological Disorders: Involves patterns of sound errors. For example, substituting all sounds made in the back of the mouth like “k” and “g” for those in the front of the mouth like “t” and “d” (e.g., saying “tup” for “cup” or “das” for “gas”). Language Disorders: A problem with understanding and/or using spoken, written, and/or other symbol systems (e.g., gestures, sign language). The disorder may involve the form of language (phonology, morphology, syntax), the content of the language (semantics), and/or the function of language in communication (pragmatics) in any combination. Fluency Disorders (stuttering) is an interruption in the flow or rhythm of speech and is characterized by hesitations, repetitions, or prolongations of sounds, syllables, words, or phrases. Motor Speech Disorders, which are impairments of speech arising from damage to the central or peripheral nervous system, such as Childhood Apraxia of Speech and Dysarthria. Augmentative and Alternative Communication (AAC), which includes all forms of communication (except oral speech) that are used to express thoughts, needs, wants and ideas. AAC is used when making facial expressions or gestures, using symbols or pictures, and writing. People with severe speech or language problems rely on AAC to supplement existing speech or replace speech that is not functional. Voice Disorders, which are characterized by inappropriate pitch (too high, too low, never changing, or interrupted by breaks); quality (harsh, hoarse, breathy, or nasal); loudness; resonance and duration. Cognitive-Communication Disorders, which are the impairment of cognitive processes including attention, memory, abstract reasoning, awareness and executive functions such as self-monitoring, planning and problem solving). Aphasia therapy: A disorder that results from damage to the parts of the brain that contain language. Aphasia causes problems with any or all of the following: speaking, listening, reading, and writing. While treating a patient who has been diagnosed with Aphasia (following a stroke), Witt works on drills and exercises to improve specific language skills affected by damage to the brain. For example, the patient may practice naming objects, following directions, or answering questions about stories. These exercises vary depending on individual needs and become more complex and challenging as skills improve. She also teaches patients ways to make use of stronger language skills. For example, some patients may find it easier to express their ideas through gestures and writing than with speaking. Witt can teach patients to use both writing and gestures to help remember words for conversation. In addition, she treats swallowing disorders in pediatrics to geriatrics. Speech therapy services must be referred by a physician. Witt said she’s always been interested in working for a hospital. Currently, Witt is available to see patients three days a week – Tuesday, Thursday, and Friday. As the patient load increases, Witt’s schedule will expand. To schedule an appointment with Witt, please call 847-5209. Terre Haute resident Jason P. Ralstin was taken to Greene County General Hospital to be treated for minor lacerations to his arm and face after a vehicle accident that occurred around 8:30 a.m. on Thursday. Ralstin, 31, told Greene County Sheriff’s Department Deputy James Carpenter that he was driving south on County Road 1000 W. when a vehicle in the opposite lane crossed into his. He said he drove his 2010 Lincoln AKT SUV off the road while trying to avoid an accident. Carpenter reported that Ralstin’s vehicle drove down a ditch and stopped on top of a frozen creek. Ralstin then exited his vehicle and waited for medical personnel to arrive. Greene County General Hospital and the Indiana Rural Health Association invite the public to a community health needs assessment meeting from 6:30 to 8:30 p.m. on Feb. 25 at the hospital cafeteria. GCGH Director of Marketing and Physician Recruiting Corey Sparks explained that the meeting will be an opportunity to talk to members of the community and find out what the health needs of the area are, so that the hospital can work to address those needs. “We’ll be working with the Indiana Rural Health Association and they will have some of their employees here and the group will be broken down into smaller groups and then they’ll have questions for the participants,” he explained, noting that they hope plenty of people attend the meeting to give them a good sample of the general population. Information from the meeting will be used to plan health care and future public health programs. Light refreshments will be available during the meeting. 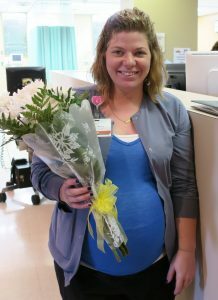 Greene County General Hospital’s Friends Friday program recently benefited Pregnancy Choices.During the month of January, departments battled one another in a penny war. The contest raised more than $1,000 for Pregnancy Choices. Pediatrician Chris Holmes, MD and Physician Assistant Corianne Vanderkolk presented the collection to Pregnancy Choices Director Michelle Brown. Dr. Holmes and Vanderkolk represented Greene County Health, the hospital’s family practice physician group, as the contest’s winning department. Greene County Health offers full spectrum family medicine at five locations throughout Greene County. Locations include: Bloomfield, Linton, Lone Tree, WestGate, and Worthington. Multiple homes in the Linton area were without electricity when a vehicle accident by the former Jack Wheeler Ford building resulted in a downed power line Friday night. Deputy Bobby Pierce, of the Greene County Sheriff’s Department, stated in a news release that 26-year-old Matthew A. Johnson reported losing control of his 98 Oldsmobile Bravada at the intersection of State Road 54 and State Road 59. Johnson allegedly told Pierce that he may have been traveling too fast and believed he struck ice when his vehicle crossed the center line on State Road 54 and traveled about 400 feet off the roadway and across other traffic lanes. According to Pierce, the Dugger resident’s vehicle struck a utility pole and then a ditch, rolled over, and came to rest upside down. Greene County Ambulance Service took Johnson to Greene County General Hospital to be treated for lacerations to his side and leg, as well as neck pain. The intersection was shut down for several hours so that REMC could repair the utility pole and restore electricity. The investigation into the accident is pending. The Linton Police Department, the Linton Fire Department, and INDOT all assisted at the scene. Bloomfield Chamber of Commerce members were updated on several items of interest during the organization’s monthly meeting on Thursday. Chamber President Joshua Riggins noted numerous upcoming chamber events. “We have several activities and events that we are meeting and planning for,” Riggins said, noting the Farmers Market, Town-Wide yard Sales, and a circus, among others. The town’s new logo will also be presented at the Bloomfield Art Festival, which is slated for later this year. In other business, Chamber Member Ed Cullison shared information about the Farmers and Mechanics Federal Team Relay for Life Fundraiser, which is slated for May 1 from 1 to 4 p.m. at 225 E. Main St. in Bloomfield. The event will allow people to dispose of old documents as well as obsolete electronics, computers, small appliances, and scrap metal. Documents will be properly disposed of by Shredding and Storage Unlimited. Green Geek Recycling will accept obsolete electronics and A&E Salvage and Recycling will accept any scrap metal such as pet food and soup cans, car batteries, and aluminum items such as pop cans. Television sets may also be disposed of for a minimum donation. Monetary donations will be accepted with all proceeds going to Relay for Life. Chamber Member Joe Boone also shared information about an advanced manufacturing certified production technician program, which offers an eight-week course that requires 20 weeks of classroom study. Classes begin March 3. For more information on the program, contact WorkOne in Linton at (812) 847-4479. Chamber Treasurer Corey Sparks also invited members to the upcoming Greene County General Hospital Commission meeting, which is slated for 6:30 p.m. Feb. 25 at the hospital. In other business, Chamber Vice President Randall Brown served as the guest speaker and provided information on small business retirement plans as well as other financial tips. Brown is a Financial Advisor at Edward Jones in Bloomfield. Greene County General Hospital is pleased to announce that Gastroenterology services are now available in its Outpatient Specialty Clinic. Board certified gastroenterologists Jitender Bhandari, MD; Prody Ghosh, MD; Amar Pinto, MD; Daniel Selo, MD; and Bret Spier, MD will provide a variety of services locally. The group began seeing patients in Greene County General Hospital’s Outpatient Specialty Clinic, which is located on the hospital’s second floor, at the beginning of February. Their specialties encompass diagnosis and treatment of diseases of the esophagus, stomach, colon, gallbladder, liver and pancreas. In addition to general consultation in gastroenterology, they also provide expertise in: colorectal cancer screening and prevention; evaluation and treatment of gastroesophageal reflux (GERD) and heartburn, peptic ulcer disease; management of ulcerative colitis and Crohn’s disease; assessment of diarrhea and constipation; evaluation of Hepatitis C and other forms of liver, gallbladder and pancreatic diseases. They will be providing diagnostic and therapeutic endoscopy and colonoscopy. The doctors are seeing patients one half day every other week; however, frequency could increase with patient volume. “We expect to do outpatient and inpatient consulting and also diagnostic and therapeutic endoscopic services locally at Greene County General Hospital. The goal is to see patients locally and take care of them locally as much as possible,” Dr. Ghosh said. Referrals and scheduling can be handled by calling 812-355-6956. The Greene County Commissioners met Tuesday morning. Auditor Matthew Baker noted that the county has had six or seven Family and Medical Leave Act (FMLA) cases in as many months. The FMLA entitles eligible employees to take unpaid leave for certain family and medical reasons while retaining their group health insurance as if they had not taken leave. He said his office needs to be kept up-to-date on these cases and requested that the commissioners allow Waggoner, Irwin, Scheele and Associates, a professional management consulting firm, to help them. The board voted to enter into an agreement with Waggoner, Irwin, and Scheele. The firm will handle FMLA paperwork and advise on the cases for a $450 a month retainer that will cover up to one FMLA case per month. A decision on installing EasyWater no salt water conditioning systems in the courthouse and county jail was tabled until the next commissioners meeting. This system promises to remove existing scaling from equipment and also prevent future scale from forming. The company surveyed the courthouse and jail in December. If the county chooses to install the water conditioners in both locations, EasyWater will waive the $850 jail installation fee. Two annual uniform conflict of interest disclosure statements were acknowledged– one from Attorney John Rowe, who is a board member of the Greene County General Hospital, and the other from County Council Member Ed Cullison, who is a Farmers and Mechanics Federal Savings and Loan Association employee. County Attorney Marilyn Hartman has prepared the final draft of a commercial lease for the former Russ Tire Center Property on the east side of Bloomfield, and the commissioners are ready to move forward with leasing the property. The state and the Indiana Rail Road Company would like to put guardrails up along County Road 350 North in the Redbird area. Commissioner President Rick Graves suggested that Hartman write a contract to allow it, as long as the county does not have to pay or accept any liability for the installation. The next regular public meeting of the Greene County Commissioners will be held at 9:30 a.m. on February 4, in the Commissioners’ Room on the third floor of the courthouse. Thursday night, at the Linton-Stockton Chamber of Commerce’s Annual Dinner and Awards Banquet, both Mayor John Wilkes and 2014 Chamber of Commerce President Dale Knotts spoke about looking forward to taking Linton into a new year and beyond. Knotts noted that it is a good time to look back into our personal lives and ask ourselves if we’re really where we want to be, what we did well last year, and what areas we can improve in this year. He said the task of the chamber is no different. “Maybe we get in a rut, maybe we continue to do the same things and once in awhile we need to shake things up and see if we can do them a little bit better,” Knotts explained, adding that it is the job of the incoming president to look forward, not just to the next year but to the years to come. “As we read and listen to the news, I think we’ve all probably come to the conclusion that money in the state of Indiana and money in Washington, D.C. is probably going to be a little bit harder to come by next year and perhaps the year after,” he continued. Knotts noted that the state legislature is considering reducing the business tax on equipment. “If that happens– and I’m not preaching politics, but the reality is that money was used for schools, hospitals, and cities. If that goes away, we’re going to have to look for a different source of funding. Mayor Wilkes and I talk often, and he made a comment awhile back that I thought was very appropriate. John said, looking at the economic situation, we’re just simply going to have to find a way to take care of ourselves. I don’t think we can depend on other folks to take care of us completely,” he stated. Knotts said he’s an optimist by nature but realistic enough to know the chamber and the city need to think about how they’ll get through the year. He remarked that Goose Pond– love it or hate it– is important to our community, and quoted a recent article estimating that 85 million Americans watch, feed, or photograph birds, and an estimated 18 million Americans are serious birders. He also mentioned that birding ranks 15th among popular outdoor activities– just below bicycling. “I don’t know that we have a good way to count all the folks who come into Greene County every year to drive down to the Goose Pond, but that’s one area that I think we can probably focus on and do a little bit better job of promoting. It’s down there for all the world to see,” he added. Knotts noted that in order to support Linton, the chamber, and Greene County, residents need to rethink their purchasing habits and refocus on where they do their shopping. Knotts said locals also need to encourage their families and their friends to come to Greene County. “I’ve always thought the Fourth of July Parade was as good as it gets for showcasing Linton, Indiana for one day of the year. How else, or how better, can you put your best foot forward to 20,000 or 30,000 people in one day? That’s the kind of focus we need. We need to impress folks who come that day [so they’ll want] to come back and visit us again,” he urged, noting that he believes 2014 will be the 109th Freedom Festival Parade. Wilkes explained that there are many projects moving forward in Linton, including the Cine Project, which he said will be great for the downtown area, and a multi-million dollar remodeling of the school. He also mentioned improvements to the Greene County General Hospital, totaling around $8 million, and the $4 million wastewater plant, which should be completed within the next two to three months. Wilkes said Linton’s greatest asset is its people, and that he once read that geese flying in formation are 71 percent more effective than a bird flying alone. Wilkes urged anyone interested in helping out with any of the projects the city is involved in to contact him or Dale Knotts. “We’ll be more than glad to put you to work because we need all the help we can get. We are going to work, and we are going to go forward,” the mayor promised. Ronald E. Fox II, 48, was arrested Wednesday on a warrant for a charge of battery committed by means of a deadly weapon or resulting in serious bodily injury, a class C felony, after allegedly fracturing another man’s skull in November of last year. Early on the morning of November 29, the Jasonville Police Department received a report of a fight involving multiple people. Linton Police Department Officer Paul Clark responded to the residence on South Lawton Street first and spoke with Fox, who told him that everyone was okay and, according to a probable cause affidavit, seemed dismissive of the situation. Clark stated that Fox said he was looking for his keys, and that when he was asked where the other individuals involved were located he said that one man was inside the residence. Clark contacted medical personnel to examine the second man, who complained of blurred vision to his left eye and stated that he could not hear from his left ear. Officer Ryan Van Horn, of the Jasonville Police Department, arrived and noted that Fox had blood and cuts on both hands. The second man told Van Horn that he had been at a bar with Fox when they met two other men. He said one of the other men flirted with some girls, which upset Fox. The man said he and Fox left the bar and went to his house but that later, when Fox was very upset and angry, the man who had upset him tried to apologize and when Fox became agitated and started towards that man he stepped between them to prevent a fight. He told Van Horn that Fox began yelling at him and then attacked him, slamming him to the ground. He added that he could not remember anything after that point, and a family member took him to Greene County General Hospital. Van Horn stated in the court document that both of the men who witnessed the situation gave a similar account of it, and said they were concerned for the man because he was not acting right after he hit his head being slammed to the ground by Fox. Fox was taken into custody and interviewed at the Greene County Jail. He told Van Horn there was an issue at the bar when another man flirted with married girls and that he thought it was tacky. He stated that when everyone was at the residence the injured man went after him and took him to the ground. He said he never slammed that man to the ground and that there was never a fight. Van Horn noted that Fox continually stated that he was the guy on the bottom trying to get on top. Officer Andrew Duguay interviewed the two other men who were present at the bar and at the residence, as well as a neighbor who said she got a call from Fox telling her to go the residence. She told Duguay that Fox and the man who was injured started fighting and that the other two men tried to pull them apart. She said they got them apart but a short time later they started fighting again. The woman advised that during the second fight the injured man was on the bottom, Fox was in the middle, and one of the other men was hitting Fox. She said she did not recall seeing Fox throw the man but that when Fox is drunk he is mean, and added that after the fight Fox went toward the house, punched a window out, and hit his head off the wall. One of the men told Duguay that the fight started when the injured man tried to calm Fox down. He said that when Fox slammed the other man on the ground he could hear his head hit, and that he then became involved in order to get Fox off the other man. He added that a neighbor broke the incident up a short time later. The last man said that the injured man was trying to keep things calm when Fox started making comments to antagonize him, and that it became a pushing match that led to Fox trying to punch the other two men. He said the neighbor arrived and tried to break the fight up and that Fox then caused the man to hit his head on the ground. He told Duguay that after they got the injured man away the other man fought with Fox to keep him down. He added that a short time later the incident was broken up by a neighbor. Van Horn noted that medical records from Greene County General Hospital showed that the man who hit his head had a skull fracture in the left occipital region. Greene County residents looking to get out of town might want to consider scheduling a good deed into their plans for Friday or Saturday. The Indiana Blood Center is currently working to restore the state’s blood supply after days of minimal collections due to the winter weather. On Monday, all eight donor centers were closed and mobile blood drives were cancelled. Tuesday, Metro-Indianapolis centers were open from noon until 7 p.m., but the Terre Haute center did not reopen until Thursday. The Indiana Blood Center supplies 60 hospitals across the state, including Greene County General Hospital, and Corporate Communications Specialist Lucy Wehking encouraged eligible donors to visit a donor center and help out. Donor centers are located at Carmel, Columbus, Downtown Indianapolis, Fishers, Greenwood, Lafayette, Muncie, and Terre Haute. If you donate blood Friday or Saturday, you will receive an Indianapolis Colts playoff poster, as long as supplies last. Wehking said the center is thankful for their partnership with the team, and for anyone who comes out to pick up a poster and help them keep area hospitals supplied. Appointments to donate can be made at www.DonorPoint.org or by calling 800-632-4722 or 317-916-5150. The Greene County General Hospital welcomed its firstborn of 2014 on Wednesday. Devyn Matthew Delph, son of Seth and Pam Delph, of Coal City, arrived at 2:43 a.m. on Jan. 1. The bundle of joy weighed in at 5 pounds and 5 ounces and was 20 inches long. Seth Delph expressed his excitement about raising another human being. Pam Delph had a smooth delivery, and noted her hospital stay was good, but explained she was ready to go home. Devyn is the firstborn to the Delph family. Several family members were also present to welcome the New Year’s baby. In lieu of Devyn’s birth, GCGH staff presented the Delph family with a New Year’s baby basket. 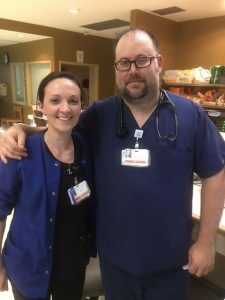 “This is the first year the hospital has become more involved [with the first baby of the year] versus the OB department by itself,” explained RN Jane Hughes. Do you want to stop using tobacco products? Greene County General Hospital is offering free tobacco cessation classes beginning on Jan. 6. The class will meet from 6 to 8 p.m. on Mondays Jan. 6 through Feb. 24 in the Violet Newton Conference Room at Greene County General Hospital. The classes are taught by Chris Sparks, RN, who works for Greene County Home Healthcare. Assisting with the classes is Racheall Lengacher, a respiratory therapist who manages the hospital’s Respiratory Therapy Department, and Lana Heath, a registered respiratory therapist. “It’s a free opportunity for them (participants) to have a healthier life. We offer free patches and gum and free support. My philosophy is you have to want to quit and you have to believe that you can. It’s like any other addiction – you have to believe in yourself,” Sparks said. Sparks said the atmosphere in the classes is very laid back and comfortable. Since she began teaching tobacco cessation classes in February 2002, Sparks boasts a 49 percent quit rate among participants. However, with her most recent class, 100 percent of participants stopped using tobacco products – cigarettes, cigars, and chewing tobacco. “That’s pretty awesome,” Sparks said. Sparks, who successfully quit smoking several years ago, offers an insider perspective for her students. • Chris is an excellent mentor. She had relayed to all of us the struggles she went through when she was trying to quit years ago, which in turn; I know she was sincere in her quest to help us with quitting smoking/chewing. She was available to us 24/7 which helped everybody’s mindset. She has a very positive attitude which is contagious and makes you try even harder. • This is a real good program. This was the second program for me and this one beat the other one hands down. • This was the best class. I wouldn’t have made it without this class. It was a great support. Hopefully this class goes on and on in the future. I give this class a high five. Thank you from the bottom of my heart. • Try it. It works! For more information or to sign up for tobacco cessation classes, call 847-9496. Cold and flu season is among us, so it’s only fitting that December 1-7 is National Handwashing Awareness Week. Keeping our hands clean is one of the most important steps in stopping the spread of germs as so many diseases and conditions are spread by people not washing their hands with soap and clean running water. If soap and water are unavailable, the Center for Disease Control (CDC) recommends using an alcohol-based hand sanitizer containing at least 60% alcohol to clean hands. The CDC’s website offers several tips for handwashing. • Wet your hands with clean, running water (warm or cold) and apply soap. • Rub your hands together to make a lather and scrub them well; be sure to scrub the backs of your hands, between your fingers, and under your nails. • Continue rubbing your hands for at least 20 seconds. Need a timer? Hum the “Happy Birthday” song from beginning to end twice. • Rinse your hands well under running water. • Dry your hands using a clean towel or air dry them. If soap and water are not available, use an alcohol-based hand sanitizer that contains at least 60% alcohol. Alcohol-based hand sanitizers can quickly reduce the number of germs on hands in some situations, but sanitizers do not eliminate all types of germs. Hand sanitizers are not effective when hands are visibly dirty. How do you use hand sanitizers? • Apply the product to the palm of one hand. • Rub your hands together. Take a few moments during Handwashing Awareness Week to ensure you’re washing your hands properly. If you have children, review handwashing tips with them. Challenge your child to create a 20 second handwashing song, or even better, help create one with them. This will make handwashing a fun experience for them. Remember, washing your hands properly is one of the most important steps to stop the spread of germs. Take your part in washing germs down the drain seriously. Late last Saturday morning Linton Police Department Officer Brock Garrison responded to a battery complaint. The victim’s injuries, which included two abrasions that required stitches, contusions, swelling, a broken nose, and a concussion, were treated at the Greene County General Hospital. Afterwards, he spoke with Garrison at the Linton Police Department. According to a probable cause affidavit, the victim said he woke up Saturday morning at about 9 a.m. to the sound of knocking. Two men were at his front door and one, later identified as Jared M. Rush, 30, of Lyons, was looking for a woman who was at the victim’s residence. The victim told Garrison that he first told Rush she was not there, but then Rush stepped into his residence while yelling for the woman. The victim then told him to get out of his house and then he would go get the woman. He tried to close the front door but Rush threw up his hand, preventing him from shutting it. The victim said he then went to get the woman, and when he returned with her Rush entered the residence uninvited and struck him in the side of the face, knocking him onto the couch. The victim told Garrison the second man, later identified as Ryan R. Wilson, 28, of Sullivan, also entered the residence and began to hit him in the face. He stated that both men punched him in the face several times while he was on the couch. After the beating, the victim said he told the men to leave, which they did after arguing for a few moments. Wilson was located, arrested, and taken to the Linton Police Department. He told Garrison that Rush and a man at the residence got into a physical altercation and he stayed on the porch, and added that he had not seen or talked to Rush since Rush dropped him off at his truck after the incident. The woman also spoke with Garrison, and told him she was intimidated by Rush but that she went to the front of the house when she heard the victim and Rush arguing. She said she saw Rush striking the victim in the face and that Wilson also entered the residence and she believed he was striking the victim in the face, too. She added that when Wilson came in he kicked a vase and broke it, and that the men stopped hitting the victim after she told them she was calling the police. The woman also told Garrison she knew both men. A warrant for Rush’s arrest was issued on Tuesday, and he was booked into the Greene County Jail around 1:30 a.m. on Wednesday. Both men are charged with battery resulting in serious injury, a class C felony, and residential entry, a class D felony. Officer Jason Wilson assisted in the investigation.